Operating all our services under one roof with our 100-strong team, we offer the peace of mind that comes with in-house experts from sales through to installation. Nimlok’s focus throughout the project is to meet your objectives whilst decreasing your investment and improving your ROI through our bespoke hire formula. Our discovery stage involves getting to know you, your objectives, brand message, products and target audience. Our Project Manager will work with you to help maximise your budget and needs. To bring things to life and allow you to see the full scale of options available to you, we will invite you to our state of the art Centre of Exhibiting Excellence. Nimlok’s unique bespoke hire concept means you can invest less on the architecture and storage costs, freeing up your budget for the elements which will drive ROI. We do this with the addition of custom elements and features alongside our range of digital engagement solutions. 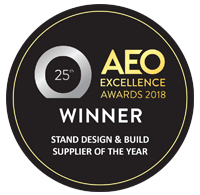 Our in-house team of stand designers will be involved from the beginning of the process to create a stunning stand design to deliver maximum exposure for your brand. Nimlok has a long-standing reputation for building quality exhibition stands. Our expert craftsmen benefit from production facilities that offer unmatched construction capabilities, including under-one-roof fabrication, graphics production, print, and AV. We believe that to give you full confidence in your stand, you need to see it before the show. That’s why we invite you back to our manufacturing facility in Wellingborough to see your stand fully built. You can then make any changes needed before your event and leave knowing exactly what to expect. Once you’ve approved your stand, you can concentrate on preparing for the show and we will take care of the rest. Our installation and dismantle team will deliver, fully install and then take down the stand. We then either put it into our on-site storage or return any hired elements to our inventory.